These are very bright and attractive, Dawn.. They look great Dawn. Lovely colour amongst the green. Thanks everyone. My mum picked it up at a sale a few years ago for me and when I set it, I didnt know what it was. Too big to move now (its in a bit of a wild area) so I'm going to try and take some cuttings. Ha ha Amy. We seem to be in a parallel existence, lol. We''ll have to put the peach trees on again soon. Lovely colour Dawn,and perfect for the wild area ! Thanks BB/Maureen: The are such a bright red, very refreshing. Should be OK for you Deida - it dont get much wetter or colder than here. Love the Bottle Brush. 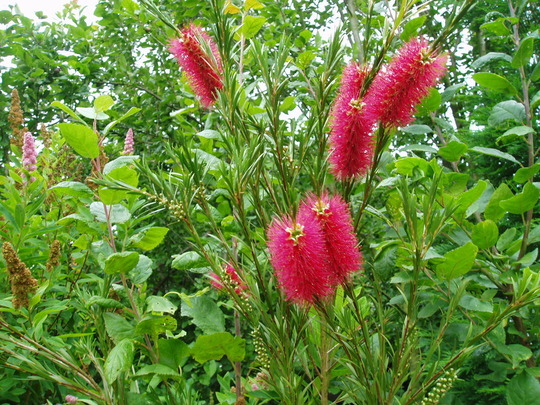 when .I went to Australia and stayed with my friends thy Had some of the Bottle Brush at the bottom of the garden. and the Magpies and parrots with green orange and blue feathers. thy were very noisy but lovely to see. My friends said thy like to eat the seed's. I do have some seeds.but dont know how long they take to grow. I set this as a very small plant about 5 years ago and now it must be 6 foot high, I've never grown them from seed but was lucky enough to buy another small one at a sale at the weekend for just £2.00. I do hope you get one going - it will be a pleasant reminder of your time in Australia. I had one of these Dawn but after a cold winter it just gave up and withered. I had two but they looked very poorly after a couple of months. Does anyone know if they prefere a particular soil or is it just warmth they need? Shame your's hasnt flowered this year, mine only had one flower last year but this time its been much better. to be honest i have been so busy this year, i have not given the garden the same tlc that i usually do, so has not been fed or mulched this year... could have something to do with it... and yes would be perfect for your raised bed. See who else is growing Callistemon Citrinus (Bottle Brush Plant). See who else has plants in genus Callistemon.